The thing is going to concerts in Tokyo can drain out your wallet quite the bit. However, it doesn't always necessary have to be the case. This time, thanks to exPOP!!!!! promoting Eggs, their new app, I got to attend an amazing live for free! This is beyond my dreams. (Technically I had to buy drinks but what the hey, that's pretty much nothing in comparison to what I'd have to pay otherwise.) Eggs x CINRA presents Volume 83 of its free event series at Tsutaya O-Nest in Tokyo. The four acts were Yes Man, Gomess, CICADA, and LILI LIMIT. It was a small venue; I'd say around 100 people were there. Possibly more since I doubt my guesstimate skills. You can check the floor plan over at their official site. Interesting tidbit: while I was trying to find the place taking the elevator up, I could hear the bands rehearsing. So me being too nosy and curious for my own good, rode the elevator up and down at least 3 times just so I could catch a whiff of what was to come. Before the review of the acts begin, I'd like to add how weird it was that nobody was taking photos?! I'm not sure if it was against the rule; however I didn't see any signs. Everyone except me and one other person took photos. Actually, in the beginning I felt peer pressured not to take them, though later on I decided to eat that thought. The photos you see are the only two passable ones. The rest are horrible, so I present you mvs instead. First off came YES MAN, a trio whom I've never heard of. They got this very whimsical Harajuku quality to their songs. Fluffy cute lyrics with edgy accompaniments. They still seem to be very fresh and appeared nervous during the MC talks. I was impressed at how good they were live. They seemed to have fun and that's what matters. Next up was Gomess. It's been amazing watching him grow as artist and equally as amazing seeing him perform live on stage. Truth be told, there were some worries in my mind that he wouldn't be able to perform due to his known anxieties. However, he came and he conquered. 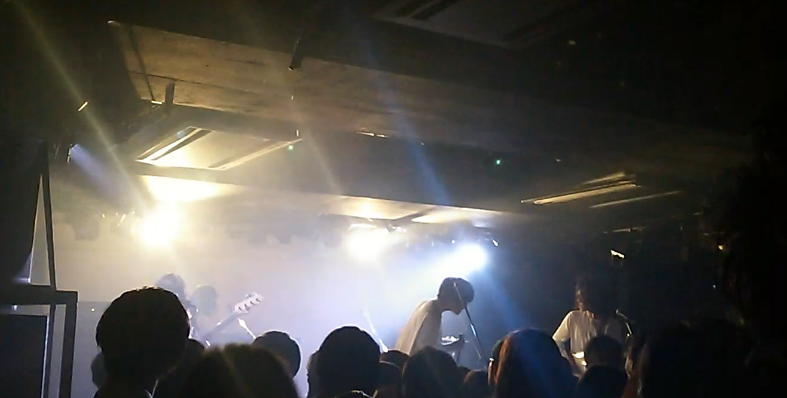 During a song about a friend, he began to cry. Despite that he performed the rest of the song without any breaks. He was just as or if not more raw and emotional than he was on his album. I absorbed all the weird little quirks he had. Like the animal-like screams he made between songs and how he rubbed his face against the speakers at one point. I feel that Gomess resonates with so many because people find his experiences relatable. For example, his trouble talking to people. He expressed that he could only look at the audience when rapping. If talking normally, he'd look at the ground. As soon as he started to put a beat on, he could face the audience. He was even able to crack a few jokes and steal some chuckles from the audience. It's easy to remember how young Gomess still is and it's exciting to see what artistic and personal changes are to come. I'm impressed by how much he's changed over the year or so! LILI LIMIT was, in no doubt, the highlight of the night. The thing is with music showcases, you can't help but compare how differently the artists interact with the audiences. The energy and mood ultimately rests on how the artist perform. In what ways do they try to engage their audience? Is it just a performance or is it a true expression of self? 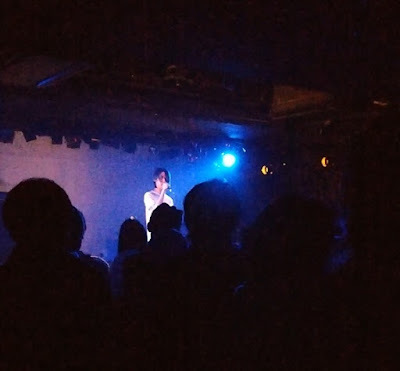 I was fascinated at how excited and alive the audience became once LILI LIMIT started playing. It wasn't just an act, they were living and breathing music through their veins. Jyumpei seemed to have the time of his life on that stage. At first when he came on, he looked dead tired. In fact I was scared he was going to pass out sooner or later. Though as the night grew older and the songs passed one by one, he began to look more alive and genuinely happy. He also has this dark, sarcastic humour to him, which is strangely charming. During the MC segment, he began talking about his birthday and how no one in the audience really cares about that and secretly swiped in some band promo amongst the birthday talk. It was amusing to watch him and Mika the keyboardist, dance. There's this idea that keyboardists/pianists don't really have much leeway to move around, which is truly in some sense. But heavens, can she dance! When not singing, she was rocking and grooving as much as she could. It was as awesome as you'd imagined. The way they played, the way they danced, all of it displayed how much LILI LIMIT loves music and how much music means to them. Their love just oozed out; it came pouring out, overfilling actually. People were waving their hands, some were dancing, others like my awkward self were bobbing their heads to the beat. I enjoyed myself so much during their segment. They completely won me over with their show and I wish nothing but success for them in the near future. Before this particular live I got the chance to see Tomofuni Tanizawa and Twenty One Pilots and yet both couldn't compare to what this event gave me. This was what I imagined a small Tokyo concert to be like. A some-what intimate setting surrounded by people who simply enjoy music. The audience polite, the artists engaging, and the music out of this world. Great atmosphere through and through. For the cost of a couple of drinks, that sounds like an evening well spent to me.